I am a proud geek. I’m not a geek of the comic book or video game variety. But boy do I love anything to do with computing. So when we visited the Computer History Museum in Mountain View, California, you better bet that I stayed the entire day from open to closing. I visited and revisited the exhibits, examining every little item as if my life depended on it. It was pure joy, and I didn’t care who saw me drooling over the Lovelace exhibit. More on that later. My love of computers started with my big brother, Gene, may God rest his soul. He was the kind of kid who at the age of five took apart a radio and put it back together and it worked. He was just meant for the world of computing, both on the hardware and software side of things. He eventually went on to develop some amazing software used in medical insurance before he left us. He was so excited about computers and I was his willing little shadow. He would teach me everything he learned and I would soak it up, mostly because it was coming from him. I had full on hero worship of my big brother who was really only 16 months older than me. The first thing we saw was the Babbage Engine. This was the first computer designed by Charles Babbage in 1791. Think about it, some mathematician drew the designs for a machine that could add, subtract, multiply and divide without using multiplication, namely what is called a difference engine. It also had a variety of outputs including hardcopy printout, punched cards, graph plotting and the automatic production of stereotypes – trays of soft material into which results were impressed that could be used as molds for making printing plates. He also invented the analytical engine which is where we get many of today’s modern computing designs such as separation of the memory (the ‘Store’) from the central processor (the ‘Mill’), serial operation using a ‘fetch-execute cycle’, and facilities for inputting and outputting data and instructions. I mean the guy was beyond brilliant. The difference engine, pictured here consists of 8,000 parts, weighs five tons, and measures 11 feet long. He was never able to complete building it due to monetary constraints. There are only two of them in the world. The first one, built according to his spec in 2002 is in a museum in London and the other is at the Computer History Museum. The coolest part was that they turned it on and it worked! It was mesmerizing. 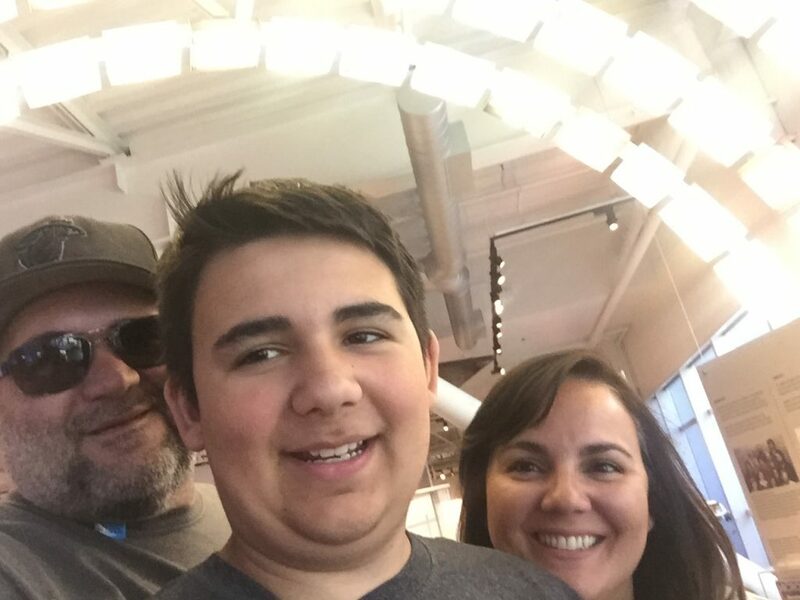 #TBT to June 2015 when the fam and I visited the Computer History Museum in Mountain View, California. @computerhistory Get ready to geek out with me… Pictured here is the Babbage Engine, the first computer designed by Charles Babbage in 1791. He invented the #computer but failed to build it due to monetary constraints. There are only 2 that were ever built to his spec, this one and one in London. It consists of 8,000 parts, weighs five tons, and measures 11 feet long. The coolest part was that they turned it on and it worked! It was mesmerizing. 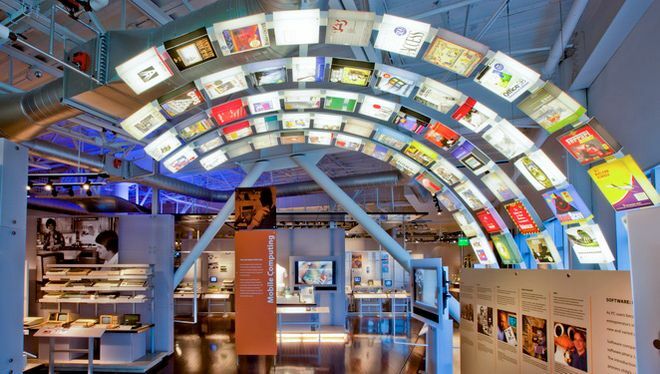 The museum takes you through the entire history of computers, the history of the internet, gaming, and so much more. We spent an entire day from early morning to when they closed going through the exhibits. 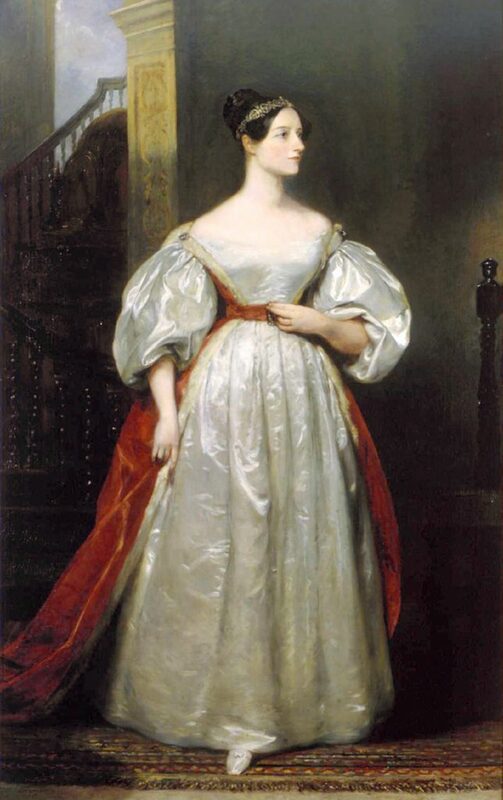 There was also an exhibit about one of my favorite women in history, Ada, Countess of Lovelace. She is known as the "first programmer". Swipe right to see some more pics of the museum, and if you get a chance, this is a "must visit". Next on my list of exhibits I needed to see was the one featuring Ada, Countess of Lovelace. She was an incredibly talented mathematician which was rare for a woman in the 1800s who is credited with creating computer programming. That’s right, a woman did that. Ada met Charles Babbage at a party in 1833 at the age of seventeen and was entranced when Babbage demonstrated the small working section of the Engine to her. He later became her tutor and she created the first published description of a stepwise sequence of operations for solving certain mathematical problems. What is even more amazing is that she did this during her spare time from being a wife and mother. She only lived from 1815 to 1852. Imagine how much more she could have created had she lived longer. Read more about her here. There are hours and hours of learning packed into the exhibits. One of the coolest parts was going through Revolution – The First 2000 years. It covers everything from the abacus to the calculator, punch cards, analog computers, realtime computing, mainframes, memory and storage, programming, super computers, mini computers, digital logic, AI and robotics, digital graphics, music and art, computer gaming, mobile computing, networking and the internet. That’s a mouthful, I know, but it really makes you think about all of the things that had to be created to get us to this point in time where we all hold massive powers of computing and wireless communications in our hands. As I noted earlier, I’m not a gamer, but my guys are a different story. My husband and two sons are the epitome of a gamer. The computer games exhibit was their favorite. 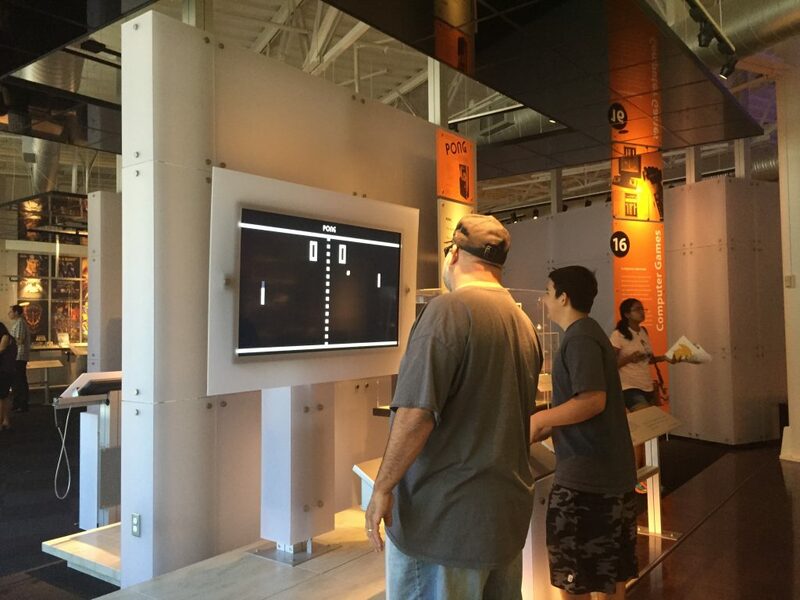 Aside from being able to play a giant game of Pong, which my teenybopper didn’t even know existed, we got o relive so many of the innovations in gaming that happened during our youth. Programmers have been trying to create the perfect computer game since the 1950s. In 1950 Alexander Douglas created a version of Tic-Tac-Toe at Cambridge called OXO that you needed a rotary phone to enter your moves. Tennis for Two, the predecessor to Pong, was created in 1958 and Spacewar debuted in 1962. In 1966 the Brown Box was designed by Ralph Baer which is the first known console that used the television to play games. In 1981 Atari released its Atari 2600 and Nintendo released their console in 1985 and the first Game Boy handheld in 1990. I could go on forever, but you can head on over to the Computer History Museum’s Graphics & Games Timeline page for an in depth look at the history of gaming. My guys enjoying a game of Pong. Now you can see why we made an entire day of this place. It’s packed with history and cool gadgets. Much of the history is really quite recent and has been happening within our lifetime, so it’s really interesting to look back even ten or twenty years to see what has transpired. As if this place wasn’t heaven on earth for me, they also have an event every Friday night called Eat, Drink & Be Techie where they host a block party in Silicon Valley, featuring innovative curbside cuisine and live music from Off the Grid, patio festivities at the Cloud Bistro beer garden, and special live programming on select Fridays for visitors of all ages. Their website has a ton of online exhibits, so hop on over and check out some more cool info and geek out with me. I didn’t know this place existed. I have to take a trip to check it out now. It’s a bit of a drive, but I’ll have to carve some time. I think in a couple years when my kids are a bit more aware of the world outside of their own lives we’ll take a trip. Thanks for sharing this! Oscar you will absolutely love it! Although the littles can enjoy, they’d definitely get a bigger kick out of it when they are older. Elayna, if you’ve been at this for 20 years, which is about the same for me, then you will eat this place up! So many of the exhibits were a cool mix of hardware and software from the 50s through the 80s, 90s and 2000s. It’s really amazing to see how much has transpired to get us to today in computing. We went there a few years ago and it was one of the highlights of our vacation! I wasn’t sure I’d enjoy it but it was really interesting and yes, the Babbage engine was incredibly cool. It was truly one of the highlights of this trip! HOLY COW! I would totally geek out about this! I didn’t even know computer history museums existed. Being able to see technology in that way and seeing how it has advanced through the years is amazing. It was amazing. There was so much to learn. I’m not in that area but this is surely a great place to be in! I’m a bit of a geek myself and this is the kind of museum that I’d love to visit. I also like how they have such interactive exhibits too. It’s surely a great place for people of all ages! I have to admit that this museum might not be up my alley however, I KNOW that my husband would be dying to go there, and would make me go! I’m pretty sure I’d learn some interesting information though! Wow! I didn’t know this place existed. So cool! You really covered a lot here. I have to Say your brother sounds like a cool guy. I had a father in law like that. He’d pull computers apart and radios and TVs and put back together to figure out the mechanics. Special Sort of person. Whoa, I never heard of this before! I’m with you too as far as being a computer geek, I love all things pertaining to computers. I could see me and my son in-law visiting the Computer History Museum, he too love computers. I bet the experience would be amazing for us both as it was I’m sure for you and your son! Thanks for sharing this post with us! Yes Ali, they certainly did! This is an awesome place! Thank you for sharing this new pkace to visit 🙂 Very kid should know this! Looks super cool! We are planning a trip to the museum in Chicago, Illinois. It’s the one where they filmed the movie Night At The Museum. We are pretty excited about it. Excelente, mil gracias por esta publicación, porque te juro que yo no sabía que existía este lugar y es super ilustrativo. Me encantó conocer más sobre este lugar que resguarda la historia de las computadoras. This place is awesome. I love computers (I spend at least 9 hours a day on one). I have to admit when I first thought of the idea of a computer museum it didn’t seem all that exciting, but as I got to reading and hearing about all Ada and other innovators from the early to mid 1900’s what blew my mind. I don’t think of computers existing until the 1990’s haha, but obviously that’s just when we got one in our home. I’m fascinated now.